Harrisburg couple John Allen and Amy Duncan got engaged at the Philadelphia Marathon finish line on Sunday. John Allen might not have run the Philadelphia Marathon on Sunday, but he sure felt like he did. "Crazy. Ecstatic. Nervous. 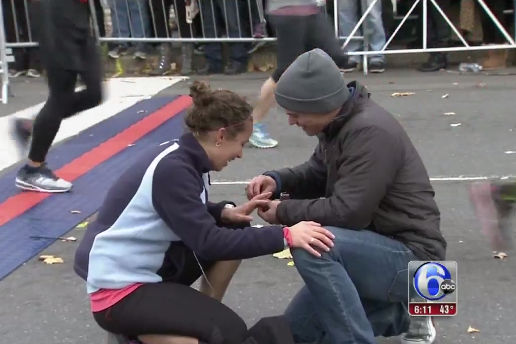 I think I have a cramp," the newly engaged Harrisburg man told 6ABC while standing just beyond the finish line, where, moments before, he had proposed to Amy Duncan. An estimated 30,000 runners and 60,000 spectators braved the gusty winds and took to the streets of Philadelphia for the race on Sunday.